Kim Dotcom from New Zealand to introduce a revolutionary Internet alternative: a new non-IP based, non-hackable, surveillance-proof and encrypted network, which will be 100% crowd-funded. The Meganet development is exciting. I don’t know all the details yet as the snippet of the interview RT has posted doesn’t give the full picture – Kim Dotcom must have encrypted the rest of the interview ;). But so far so good. We need this! I’ll be following the developments as they unfold. It’s shameful that a Prison-Based Slavery system still exist today. Last week, several states—including South Carolina, Virginia and Alabama—removed the Confederate flag from their public buildings and are signaling their intentions to abandon the symbol for all state uses (ex. license plates). This is very encouraging and definitely a step by southern states towards distancing themselves from their racist histories. 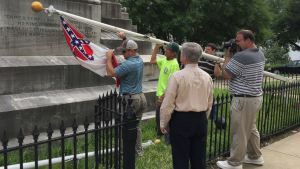 Unfortunately, the removal of the Confederate flag is a largely rhetorical gesture, given the fact that many of the same evils that the Confederacy stood for are alive and well—one of these is the institution of slavery. Dr. Don Huber, an agricultural scientist and expert in microbial ecology has discovered a new organism in genetically engineered animal feed. This mysterious organism, which he categorizes as a mycoplasma that has since been clearly linked to infertility and miscarriage in cattle, horses, pigs, sheep and poultry, which he also links to human fertility problems. Mycoplasma are the smallest living cells yet discovered. Their nature is essentially unknown, as far as their relationships with other organisms. They can survive without oxygen and are resistant to penicillin. The GM Ban List is Getting Longer! The Food Revolution Continues. . . The burning of churches is domestic terrorism. This clearly meant to disempower and demean thru racism and ignorance. It’s time to uphold the law equally for every member of society. Your solutions are not only reasonable but practical. Thank you!